OBJECTIVE To examine the association between depressive disorder and insulin resistance in a sample of young adults using the Composite International Diagnostic Interview to ascertain depression status. RESEARCH DESIGN AND METHODS Cross-sectional data were collected from 1,732 participants aged between 26 and 36 years. Insulin resistance was derived from blood chemistry measures of fasting insulin and glucose using the homeostasis model assessment method. Those identified with mild, moderate, or severe depression were classified as having depressive disorder. RESULTS The 12-month prevalence of depressive disorder was 5.4% among men and 11.7% among women. In unadjusted models mean insulin resistance was 17.2% (95% CI 0.7�.0%, P = 0.04) higher in men and 11.4% (1.5�.0%, P = 0.02) higher in women with depressive disorder. After adjustment for behavioral and dietary factors, the increased level of insulin resistance associated with depressive disorder was 13.2% (−3.1 to 32.3%, P = 0.12) in men and 6.1% (−4.1 to 17.4%, P = 0.25) in women. Waist circumference was identified as a mediator in the relationship between depression and insulin resistance, reducing the � coefficient in the fully adjusted models in men by 38% and in women by 42%. 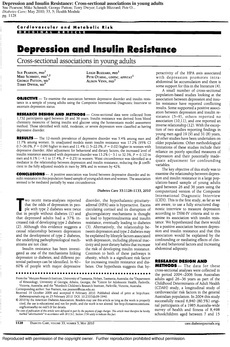 CONCLUSIONS A positive association was found between depressive disorder and insulin resistance in this population-based sample of young adult men and women. The association seemed to be mediated partially by waist circumference.